From Mobiles to Drones: The Next Leapfrog Technologies session at the Global Clinton Initiative – University 2016, hosted at UC Berkeley. See photos of the session. NASA Ames – Dava Newman Demo: BEST (Berkeley Emergent Space Technologies) Lab @ NASA Roverscape giving a demonstration for Dr. Dava Newman, the NASA Deputy Administrator on July 17 during her visit to NASA Ames in Mountain View, California. BEST is collaborated with NASA Ames on tensegrity robotic projects. ME110 Tradeshow Spring 2015: Photos from the final tradeshow for ME110/ UGBA190T-2 (Introduction to Product Design) Spring 2015. The tradeshow was held in the Innovation Lab at UC Berkeley’s Memorial Football Stadium. Two of the projects were filmed by KQED Education. BEST Lab 30 Year Reunion: Photo album for 30 year reunion to be held August 7-8, 2015. TEDxEuclidAve: Achieving Social Impact, Omoju Miller and guests, Oct. 2012, Event Photos. Design Night at Autodesk with MEng Product Design students and Jeremy Faludi, doctoral student advisor. Berkeley Sustainability in Products and Practice, June 2012: Alice Agogino, David Edmunds, Ryan Shelby and others talk about sustainability in various aspects of life – from cultural sustainability that is implemented in the houses built for the Native American Pinoleville Pomo Nation people to implementing sustainability in surf boards by reusing and utilizing sustainable materials. TEDxEuclidAve: Achieving Social Impact, Omoju Miller and guests, Oct. 2012. Greening The Internet of Things: Smart Products in a Smart Grid, Alice Agogino’s Distinctive Voices Seminar for the National Academy of Engineering, Aug. 2011. CARES receives Chancellor’s Award for Public Service video of ceremony, May 2010. 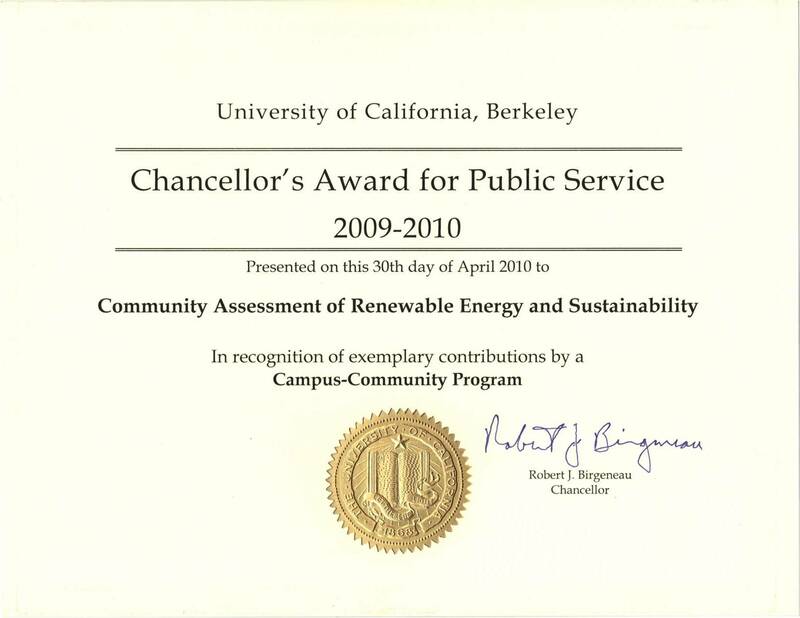 The Tribal CARES team wins the 2010 Chancellor’s Award for Public Service Campus, Community Assessment of Renewable Energy and Sustainability – Pinoleville Pomo Nation Partnership.